After what seemed (and probably was) a lifetime of hiatus this is my latest blog update. I hope there are still people out there willing to read and see what I have to show, but nevertheless, here I am writing down my latest hobby achievements. 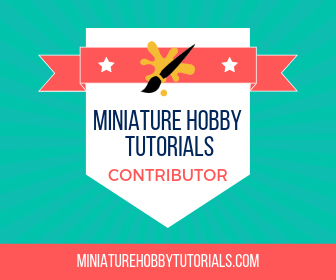 Contrary to what it may seem from my online activity, I have been quite active hobby-wise but not able to make regular posts about my activities. 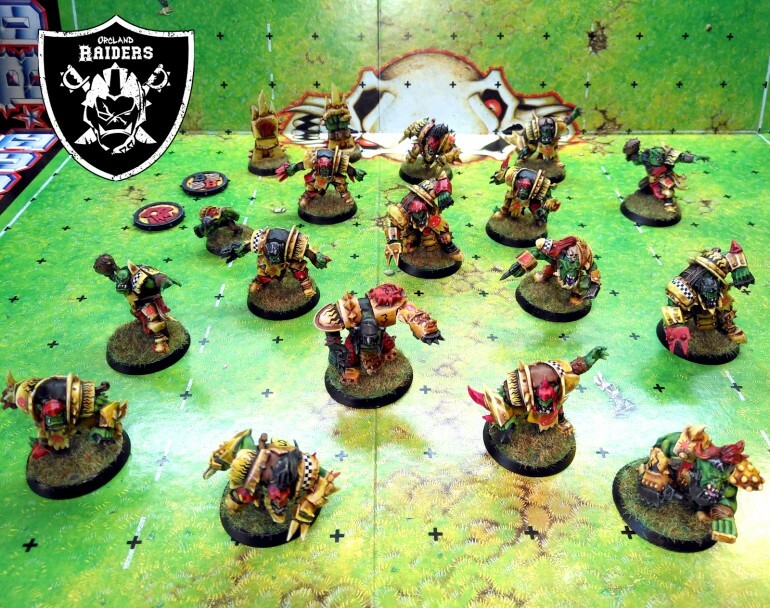 Most of my gaming activity of the past months has to do with Blood Bowl and Necromunda, with Blood Bowl gaining most of my hobby time share since I took part in a couple of leagues. Being a quite slow painter, I have just managed to finish up my Blood Bowl Orc team, the famous Orcland Raiders. 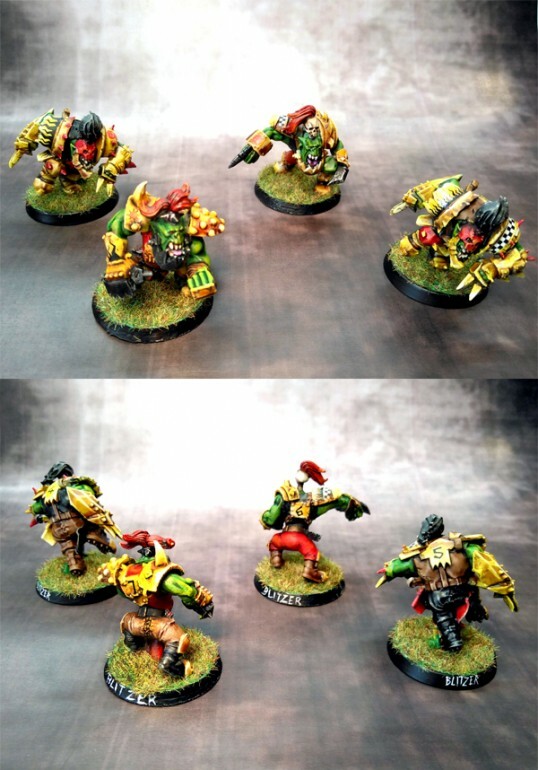 I have decided to stick to the original colour scheme, mostly because I love painting yellow (those of you that follow me all these years might have figured it out ;) ), but also because I think yellow suits Orcs wonderfully! As I was building my team, I have stumbled upon a problem that I’m sure most orc players have, the absence of Black Orcs and Blitzers from the basic sprue. 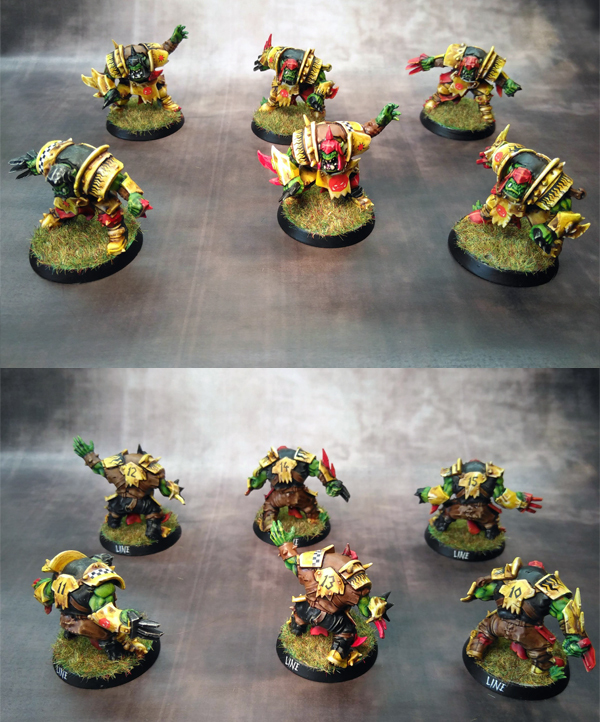 I had decided to play with 4 Black orcs and 4 Blitzers, and I had only 2 of each available in the box. 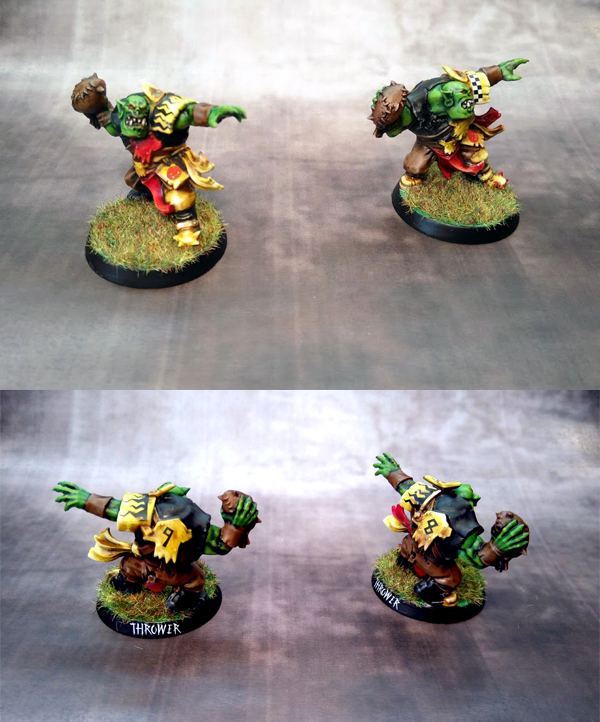 So, I have decided to build my own Black Orcs, one of them you can see in the pictures above. Where is the second one you ask? Well, in the very first game that I have played one of them died, and then in my second one I lost another one. I have eventually managed to buy one back later on in the league, so I decided to build only one out the initial 2 extras that I had on my roster. I may eventually build another one whenever I decide to play them again. 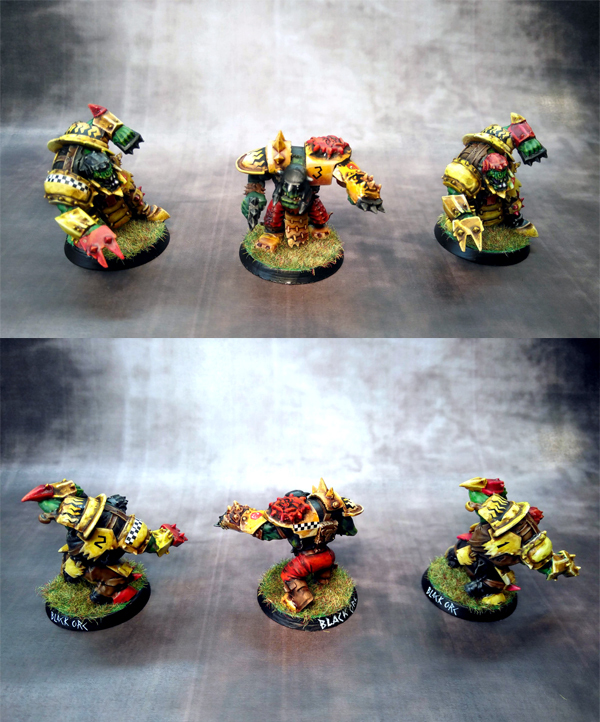 Blitzers are a must in any Orc team and I had to include 4 of them. Same problem here, I had to build 2 and again my Ork bitz box came in handy. Nothing fancy here as you may probably see. Staying to the positionals, the Throwers are straight from the box, although one too many, I painted both to complete the team. Of course the backbone of the orc team, the Linemen, couldn’t be absent, so here they are in all their black and yellow glory! Last, but definitely not least, the Goblin of the team. I built him using bits from the old Goblin kit and adding a wire frame to create the blood bowl helmet. One big (in the quite literal manner) absence from this group photoshoot is my troll. He is currently in my workbench getting some paint and he will get his photos once he is finished, so keep your eyes on this spot for more. I am also going to post updates on him on Instagram, plus I am planning some live videos on him so have a look for them too! I would love to hear your comments and remarks! Awesome work on these. The conversions work well and blend in with the rest of the team. Also, terrible luck with the Black Orc dying in the first game. Damn. The second one you lost, he also died? That’s a lot of bad luck and a lot of extra gold you had to make up to get them back. Yes the second orc also died. I was almost ready to forfeit but I played till the end eventually. It seems that this team doesn’t like me but I hope to get redeemed in the next league! Looking good! Yellow really does work well for Orcs*. Serious bummer having two Black Orcs killed off so soon, tho. 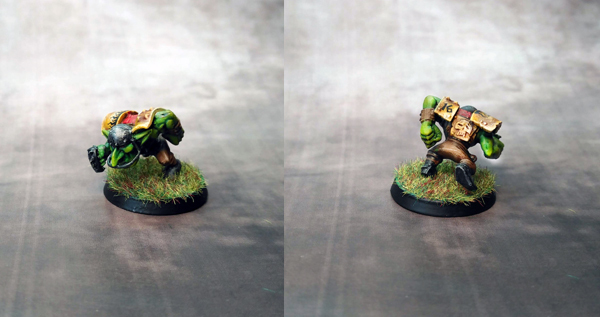 Nice conversion for the Gobbo, too. *For the most part. For some reason, I really dislike the studio paint jobs on the Ironjawz, even tho I like essentially the same scheme on Bad Moonz.